Thousands of runners will throng Istanbul on Sunday to run the Vodafone 40th Istanbul Marathon, the world's only cross-continental race. The slogan this year is: "Run Istanbul for a Healthy Future." A record number of runners are expected to participate in the world's only transcontinental marathon. "A record number of runners are expected in the 40th Vodafone Istanbul Marathon on Nov. 11," Vodafone Turkey Deputy CEO Hasan Suel told Anadolu Agency (AA). "We are seeing a great deal of interest in the marathon compared to last year. The Istanbul Marathon has attracted a great deal of attention from foreign and Turkish runners," he said. "[This is] the only marathon in the world where the runners cross two continents. This marathon also gives the participants a chance to see the city," he said. The marathon will start on the Asian side of Istanbul's July 15 Martyrs' Bridge, formerly known as the Bosporus Bridge. The finish line is located at the historic Sultanahmet Square on the city's European side. Officials announced that many of Istanbul's central thoroughfares, including July 15 Martyrs Bridge, Eurasia Tunnel, Galata Bridge and Eminönü-Bakırköy coastal road will be closed to traffic from early Sunday and will be gradually open for traffic. Recalling this year's motto "Run Istanbul for a Healthy Future," Suel said that "running is becoming very popular in Turkey." Around 30,000 professional runners, including 3,500 foreigners from more than 100 countries, will take part in the 40th Vodafone Istanbul Marathon. About 5,000 runners -- more than half of them foreigners -- will compete in the 42-kilometer marathon. In addition to that, about 100,000 people are expected to run in the 8-kilometer (5-mile) transcontinental Istanbul Marathon Fun Run. The top five countries sending runners are Russia, Germany, Ukraine, Britain, and France. Fifty-five elite runners from Turkey, Kenya, Ethiopia, Azerbaijan, France, Bahrain and Morocco, will participate in the marathon. Compared to recent years, the number of foreign runners in the marathon has doubled. The event features a 42-kilometer marathon, and three other races on 15-kilometer, 10-kilometer and 8-kilometer courses. It will also feature a race for wheelchair users. Vodafone is the main sponsor of the race, organized by the Istanbul Metropolitan Municipality and its Spor Istanbul company. Last year, Kenyan athletes dominated the marathon. In the women's category, Kenyan Ruth Chepngetich came first, while French athlete of Kenyan origin Abraham Kiprotich was the best male runner. The Bosporus Bridge saw its first cross-continental marathon back in 1979. Over the years, it has become one of Turkey's most popular sports events. The first Eurasia Marathon was won by Hasan Saylan, a Turkish athlete from Zonguldak, with a time of 2 hours and 35.39 minutes. The course of the marathon has changed three times over the years; therefore the winning times vary between different periods. Well-known athletes, like Ian Thompson and Terry Mitchell, have participated in the Eurasia Marathon, which also became a testing ground for Turkish athletes, many of whom went on to run in international races. 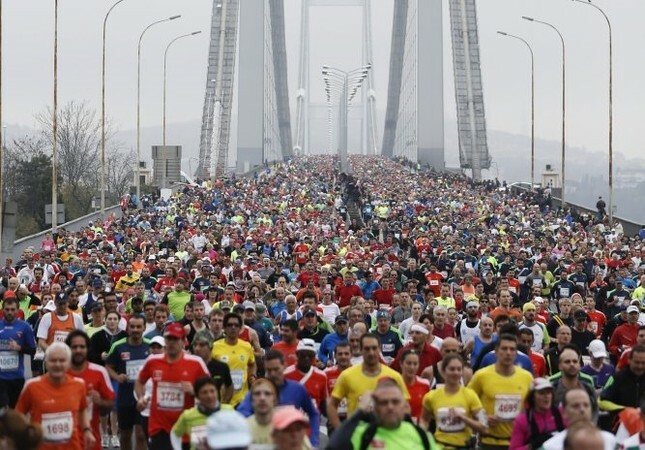 The Istanbul Marathon is among 17 marathons in Europe and 38 marathons in the world. For more information, visit www.maraton.istanbul and follow the #runistanbul and #run4health hashtags on Twitter.